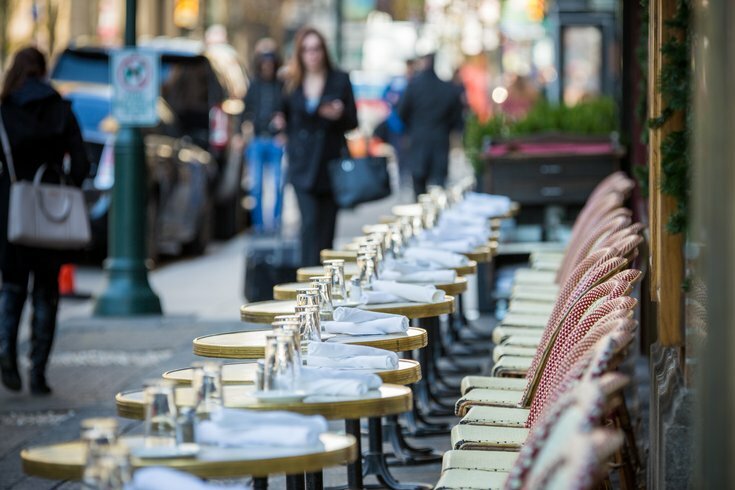 Outdoor dining near Rittenhouse Square in Center City Philadelphia. Tipping is practically a reflex when we eat out--the only debate being the percentage we leave and where to stash the cash, should we have bills on hand. One interesting thing about minimum wage, for tips, most people don't know--even I didn't know there was such a low tip minimum wage until I was employed at ROC--but there are seven states in the west that have never had tipped minimum wage, and that includes states like Alaska, Nevada and Idaho. And in those states, people tip a little better, but the problem with tipping is, as we've seen with sexual assault and harassment scandals in Hollywood and news media, the whole idea--one of the prime drivers of sexual harassment is the power dynamic. Males being in charge, in leadership, and women assuming they have to do whatever is asked of them in order to keep their employment. In the case of a tipped minimum wage, a sub-minimum wage, that happens twofold. You're subject to the same pressures as anyone else employed by a male superior, but additionally, face sexual harassment from the tipping public. In fact, many restaurant owners will tell servers they need to dress more sexually to increase tips, show more cleavage or have a shorter skirt. And as a result, workers in the service industry face sexual harassment at twice the rate of other industries and more than any other in the U.S. I know there have been efforts recently to give workers a higher wage and no tips. What's going on with that? Will that catch on? Why don't alcoholic beverages have a nutrition label? The situation is such that, one of the reasons we advocate for One Fair Wage, the elimination of the tip minimum wage and bringing folks up to $15 an hour across the board, is 70 percent of tipped workers are women and the majority in Pennsylvania are not working in high-end steakhouses where you can make a substantial living, but a majority are working in fast-casual like IHOP, Fridays, Applebee's, restaurants of that nature. Restaurant owners are required by law to make up the difference between tip minimum wage and minimum wage if the servers are not making enough in tips, but the U.S. Department of Labor has determined 84 percent of restaurants are not in compliance with that regulation. Here in Pennsylvania, we advocate for one fair wage. Is there a tipping culture elsewhere--in other countries? I'm looking at going to Barcelona in the fall and I know there are a lot of European countries, as well as Canada, where there has not been a tipping culture. And what I found in Europe, in particular, is servers and restaurant workers are viewed as the professionals they are and are paid a substantial income. Tipping has begun to drift into these other nations and in my research, on traveling to Spain, tipping is absolutely optional, and the highest rate folks do tip, if they tip, is about 10 percent. And that's for great service. And that's one of the problems with tipping in America: In major tourist areas such as Orlando and other areas, you will see as you come into the airport or tourist areas that tipping is explained in various European languages, and folks are encouraged to tip--because they generally do not.